We Specialize in Corporate Events and Birthday Parties! Odyssey Escape Game offers corporate team-building and family activities. Team-building and family bonding has a new face, ESCAPE GAMES! A great change of pace; collaborative & fun! Our accommodations set us apart from other Escape Game companies. Come ESCAPE with us! Book your next birthday party or team-building event by calling us today! Break out of the cubicle! Observe how your employees interact in a new, unique and challenging environment that encourages collaboration. Odyssey Escape Game escapes the cubicle with fun, team-building exercises that stimulate creativity, synergy, and efficiency in the workplace. By solving a myriad of puzzles, finding hidden clues and interactive games your team will collaborate at a higher level. Escape games encourage collaboration. Participants must rely on each other's individual strengths to solve riddles, puzzles and mysteries. 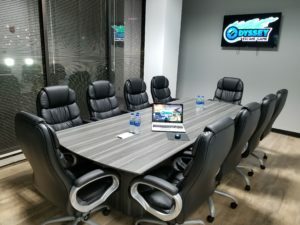 By encouraging employees to rely on each others’ individual strengths, Odyssey Escape Game provides an environment that literally brings out the best that your team has to offer. Create cohesion in your workplace with employees that are inspired. Our escape games are designed to challenge different thinking processes, forcing participants to work to their full potential. Get To Know Your Staff Better! The result of placing co-workers in a high-pressure team-building environment, where groups must actually rely on one another to complete the task at hand, is a closer team who is ready for whatever obstacles that may arise in the workplace. It’s time for a change! You have the option of observing your employees progress remotely in our state of the art conference center. Managers can participate or simply observe their employees, in real-time, tackle never-before-seen challenges while under the gun. This behind-the-scenes, team-building experience allows supervisors to take notes on who are the leaders and who are the followers. Get the most out of our services with one of our pre-assembled packages designed exclusively for corporations and large groups. Each package includes one hour access to our state of the art conference room, full use of our breakroom facilities, as well as the use of our comfy lounge area. Feel free to contact us today with any questions or special requests you may have. We will do our best to accommodate all of your needs! Why choose Odyssey Escape Game? Hear what our Corporate Customers are saying! We partnered with Odyssey Escape Game to cater our Quarterly Meeting and had a BLAST! Michael and the team were incredibly helpful in accommodating to our needs and were able to provide an all-around great team-building experience for our 40 employees. Everyone from our Firm has said they had a great time last evening playing Odyssey Escape Games! The room décor was fabulous and the games were challenging and fun!